Previous researchers have hypothesized that site-faithful animals may benefit from the presence of familiar neighbors. This study compares the relative costs of territorial defense against new and former neighbors by male willow ptarmigan (Lagopus lagopus). Territorial defense against new neighbors appeared to require a greater expenditure of both time and effort than did defense against former neighbors. Territorial males that had several new neighbors spent a higher proportion of time fighting than did males with fewer new neighbors, and males with both new and former neighbors spent a greater amount of time fighting with their new neighbors, on average, than with their former neighbors. In addition, fights with new neighbors occurred relatively more frequently and were longer than fights with former neighbors. Finally, fights involving new neighbors tended to escalate to higher levels than fights between former neighbors. 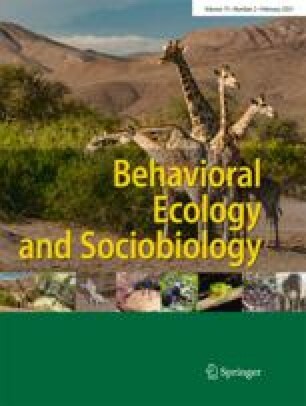 Reduced defensive costs for site-faithful, territorial males may provide one explanation for the tendency of males to be more site-faithful than females in many species.